Ray Anthony Lewis, Jr. (born May 15, 1975) is a former American footballlinebacker who played in the National Football League (NFL). He played his entire professional career for the Baltimore Ravens which spanned 17 seasons from 1996 to 2013, and for the University of Miami in college. Drafted by the Ravens in 1996, Lewis was the last player remaining from the inaugural team at the start of the 2012-13 season. Lewis was selected to 13 Pro Bowls and named an Associated Press All-Pro 10 times. 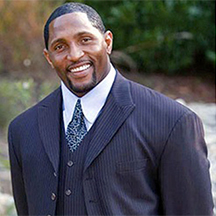 He won the NFL Defensive Player of the Year in 2000 and 2003, becoming the sixth player to win the award multiple times. Lewis was also the second linebacker to win the Super Bowl Most Valuable Player Award and the first to win the award on the winning Super Bowl team. After a triceps tear that sidelined him for most of the 2012-13 season, Lewis returned for playoffs and guided the Ravens playoff run and a victory in Super Bowl XLVII.